MultiLoft™ Encore is made using Convertible Solutions cohesive glue technology and Mohawk’s Superfine range of papers, certified to run on the HP Indigo press. Looking for a pimped-up business card, with comps, wedding invite or greeting card that takes thickness to the max? MultiLoft™ Encore is where it’s at. Colour is built into the sheet of paper. So it’s ultra white on one side and coloured on the other side. And we also sell insert colours so the options are endless. 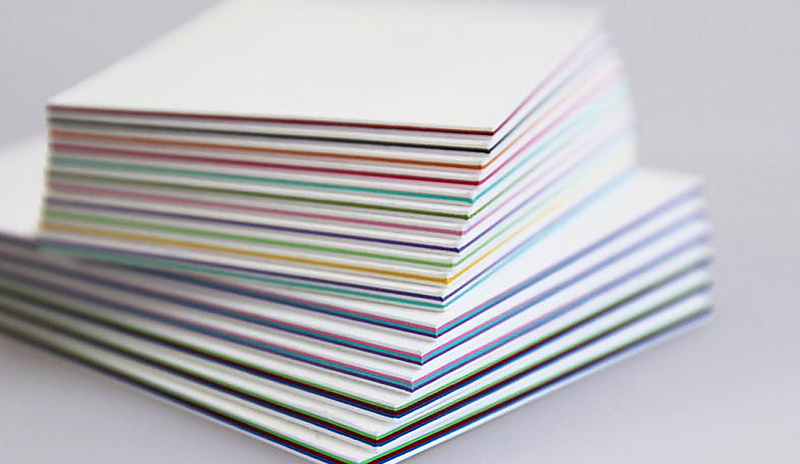 To achieve double the thickness of what is an already pretty thick card, print on the white side of two different sheets of MultiLoft™ Encore and then stick them together. Each double thick finished piece is approximately 634gsm. The MultiLoft™ Encore inserts have cohesives (sticky stuff) on both sides and can be placed between the sheets to create colourful, eye-catching projects. As an example, adding x1 insert sheet, the thickness goes up to approximately 904gsm. Keep adding inserts to achieve your desired thickness. After your project is printed and constructed, you can then diecut your job into the desired shape. MultiLoft™ Encore sheet colours: Ultra white/Kraft (brown), Ultra white/Black Licorice, Ultra white/Wild Cherry, Ultra white/Pacific Breeze, Ultra white/Orange Fizz, Ultra white/Blue Raspberry. Click here for the full sheets stock chart. MultiLoft™ Encore insert colours: Kraft (brown), Black Licorice, Wild Cherry, Pacific Breeze, Orange Fizz, Blue Raspberry. ‘Strength and Beauty’ Knight Promotion 2016. Subscribe to get updates in your inbox. We’re the curators, bringing you the materials so your big ideas become a reality. The real magic starts with you, so we like to celebrate the wonderful world of print right here. Keen to see your work on the blog? Hit the ‘Submit’ button.